The software is being completely rewritten, and the name will be changed to ProjectFolders, to reflect its ‘project-based writing’. Your documents will not be stored in SQLITE database anymore, but in a folder in your computer. This is for data security and avoid vendor-locking. For simplicity, all documents will be stored in a centralized folder. This approach has been proven by the famous Dropbox software. ProjectFolders add-in will greatly utilize a tagging system for file management, this approach has been proven by Gmail, EverNote, etc. The metadata (synopses, notes, tags, etc) will still be stored in a SQLITE database, so that these data will be for search-able. The new design will address the major problems (such as performance and data security) appeared in the current version of Writing Outliner, and suggestions made by current users. First screenshot below, any comments are welcomed. PS, I’d like to take this chance to ask my fellow Writing Outliner users, do you think the full text search and index cards in the current version of Writing Outliner very important and must have? 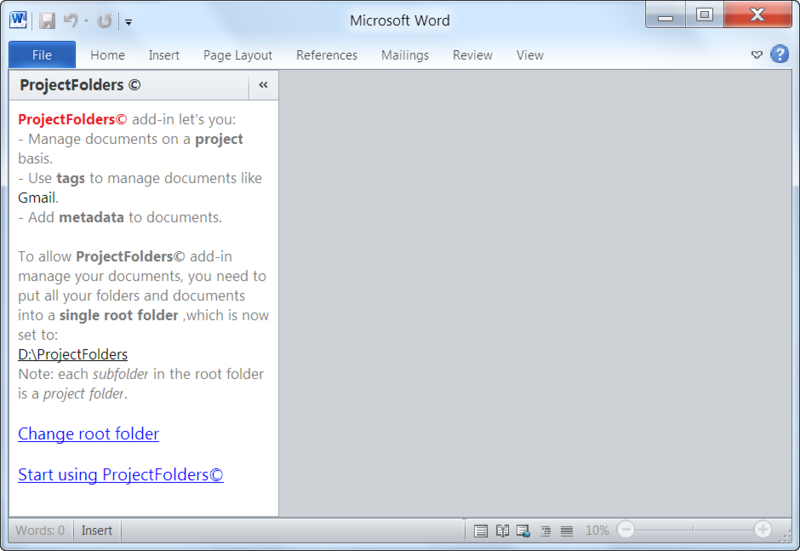 ProjectFolders will be able to improve Writing Outliner project files (.woprj). ProjectFolders will fully support unicode . ProjectFolders will be much more stable and more compatible with other Word addins such as Zetero, etc, all after all, this is one of the major issue of Writing Outliner ProjectFolders wants to address. Re. release dates, I’d say beta will be out in less than half of a year, you know, everything is being rebuilt from from ground up. Once the beta is ready, I’ll send email notifications to current users and newsletter subscribers. There will be a version for 64bit MS Word. Re the naming changing, I want it to be more understandable and shows that it’s not only for writers but also for managing project documents.